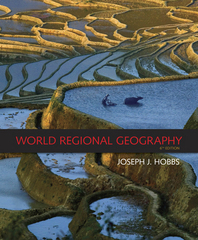 World Regional Geography 6 Edition The sixth edition of WORLD REGIONAL GEOGRAPHY offers you a rich cultural and physical geographic understanding of the world's eight regions. In the text's "Profile" chapters, the author presents brief, thematic overviews for each of the eight regions. Subsequent regional chapters present traditional, current details on a local level, including geographical factors and in-depth observations. The art program offers many new and revised maps, as well as photos submitted by the author that depict cultural and geographic aspects of the world's eight regions. New and extensively revised thematic maps centered on topics like language, religion, and ethnicity allow you to make cultural and regional comparisons quickly. You have access to these maps electronically for further study and use in the classroom. Clearly outlined chapter objectives emphasize more thematic discussions in the subregional chapters as well as highlighted textual discussions. The author also ties in relevant historical geography to give you a context for current events and geopolitical issues in the world.